A smarter approach to environmental health. Once considered sacred by Chief Seattle, it used to flow with healthy salmon for the Duwamish first people, who were later removed by incoming settlers. After more than 100 years of industrialization, it now carries dangerously high levels of toxic waste. are considered harmful to humans. There are more than 40 different contaminants that are identified as being above the safe limits for humans and the environment, including PCBs, dioxin, carcinogenic PAHs, and arsenic. Studies show that the low income communities that live along the river have higher rates of heart disease, asthma, and other illnesses, than other areas in Seattle. The fight for a Duwamish River cleanup spans over many decades. After years of advocacy, the EPA declared the lower 5 miles of the Duwamish River to be a federal Superfund site in 2001. Responsible parties include the City, County, Port and potentially up to 100 industries on the river, most notably, Boeing. A long battle ensued to determine how the cleanup should be done and how much it should cost. Finally in December 2014, the EPA released their Record of Decision of a $342 million cleanup plan to take place over the next 23 years. How can communities and stakeholders ensure that this investment will result in a cleanup that will work and will last for generations to come. There's a massive amount of information out there, but it needs to be assembled into one place, and updated in real time. This is a photo of the Riachuelo River in Buenos Aires, Argentina, which is also suffering from high levels of pollution. Both the Duwamish and the Riachuelo River are facing a long, arduous, cleanup process. A small group called the GarageLab Collective came together and coded this map to track the government mandated cleanup of the Riachuelo River. 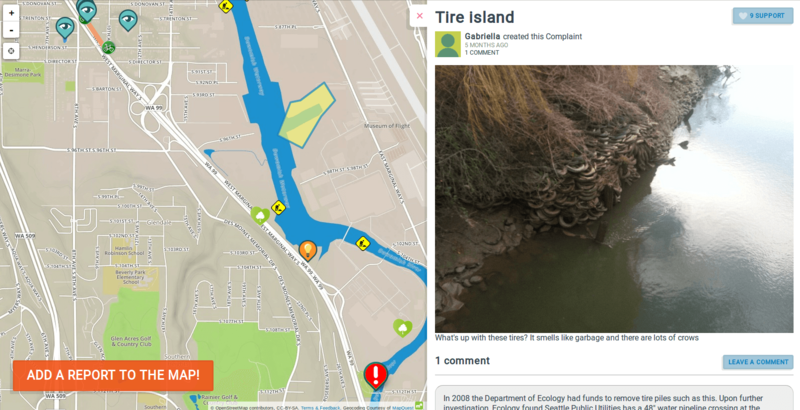 Recently, GarageLab reached out to the Duwamish River Cleanup Coalition in Seattle, and both parties are eager to start working together to build a live interactive map to keep the Duwamish cleanup accountable and on track for the public. This will be a great way not only to keep people informed and up to date but to empower them through the public process of the cleanup. Click the image to open the map. If you have funding capacity, let's talk about a small grant to get us over the finish line. Otherwise, please chip in to our crowdfunding campaign (coming soon).